Wait, wait, wait, it cannot be fall yet. For one thing, it’s still too warm to be fall, and for another, I still have to tell you about some summery dishes like these tacos with the eggplant and ancho spread. 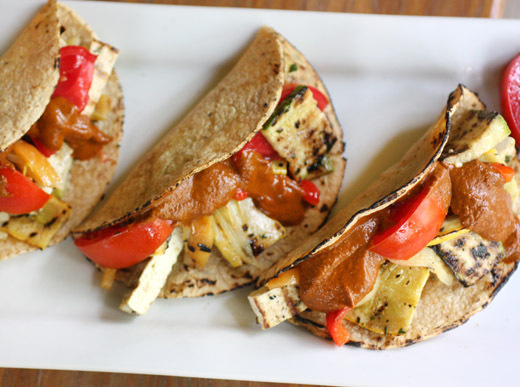 The tacos are filled with grilled yellow squash, zucchini, bell peppers, and tofu which were marinated first in white wine and olive oil with herbs. Grilling the marinated vegetables and tofu made them smoky-flavored and delicious, but it’s the eggplant-ancho spread I really want to discuss. I’ve pureed anchos into various sauces in the past, but this one was unique. By grilling an eggplant, the flesh became completely tender, and adding that to the anchos for the puree resulted in a lighter tasting spread with a creamy, smooth texture. Smoked paprika and cumin gave it added dimension as well. This was from the June issue of Food and Wine, and the recipe is online. I made a couple of very minor changes to the original recipe. I marinated tomatoes with the rest of the vegetables, but I didn’t grill the tomatoes. While everything else was grilled, I left the tomatoes raw so they wouldn’t fall apart or become mushy. The marinade was made with white wine, olive oil, parsley, salt, and pepper, and I used basil instead of the suggested mint. I prefer basil to mint, and I have happily growing basil plants whereas every time I plant mint it dies. Pressed, drained, and sliced tofu, along with sliced vegetables, were marinated for just a few minutes before being grilled. For the spread, a whole eggplant was grilled and turned from side to side until charred and tender. When the eggplant was cool enough to handle, the flesh was scooped from the charred skin and left in a colander to drain. Anchos were stemmed and seeded and rehydrated in boiling water. The chiles were drained and added to the blender with the eggplant flesh, smoked paprika, cumin, a tiny bit of brown sugar, and olive oil. I used corn tortillas for the tacos, and I warmed them one at a time over the flame of a burner on the stove. 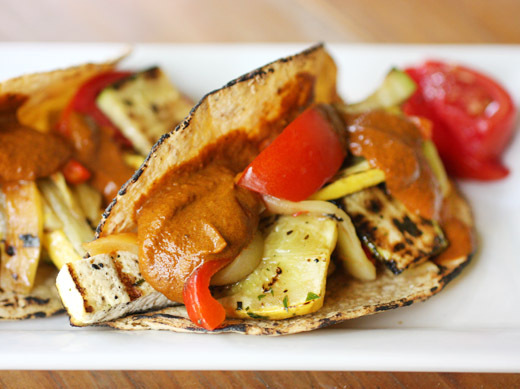 The chopped grilled vegetables, grilled tofu, and raw tomatoes were packed into tortillas and topped with the spread. I feel like I learned some kind of sauce-related secret here. For a velvety, smooth but light texture, add cooked eggplant flesh. I’m wondering what other sauces and spreads this could transform. And, I’m wondering how many other dishes I could top with this same eggplant-ancho spread. Wonderful and ever so original! I particularly like the ancho sauce. No worries, it's still summer here! What seductive tacos, filled with succulent veggies and an irresistible ancho sauce. My eggplant loving family will adore these! What an original and delicious taco recipe! The eggplant ancho sauce sounds amazing too. this taco recipe is so creative! looks and sounds sooooo good! Terrific spread - this sounds totally flavorful. 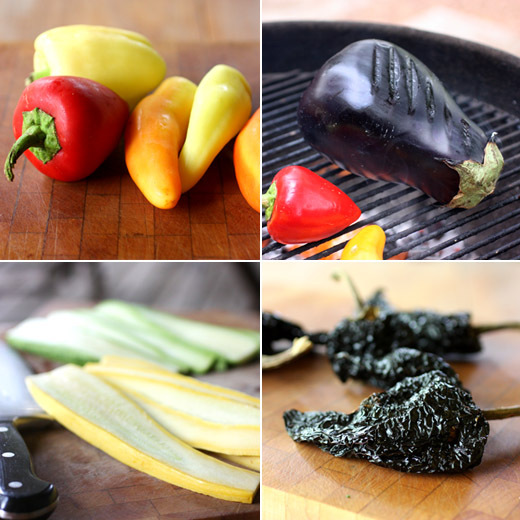 Ancho in anything has my vote, and combined with eggplant? Super idea. I've never had tofu tacos, and they sound totally worth trying. Good stuff - thanks. Perfect vegie meal Lisa :) Yum! So many beautiful rich colours. That's such a cool idea--total mix of Italian and Mexican! Tacos are one of my favorite foods and these look so good! I agree: can't believe summer is already over... sigh. Great tacos, Lisa. Doesn't hurt that eggplant is on my list of favorites. Great idea to team it with anchos. that's a lot of grilled goodness, and the sauce sounds amazing! Eggplant ancho spread sounds AMAZING. I currently have both growing in the garden right now. Awesome recipe. Tofu... I wish I had the guts to try this recipe, but I am afraid my beloved might think I crossed a very dangerous line as far as our relationship is concerned... He is the anti-tofu by default. Sally: The sauce would be great with chicken too! Being Asian, I eat tofu a lot, but never really grilled or cooked it this way. THis is for sure sound very tasty. Especially the ancho sauce, it's hard to resist. I know what you mean - I still have some summer recipes that I'd like to post too! The eggplant spread sounds wonderful. What a great find! I agree with you Lisa, I can't believe that it is already fall! And there are so many great summer recipes yet to make. I LOVE this taco recipe! So healthy too, which is what I need so much these days! Thanks for your creative cooking ideas that you always share! The eggplant ancho spread sounds like a delicious treat!! Just these few days, I would exclaim the same - it is too warm to be fall!!!! Having said that, I would still be tempted by this grilled tofu tacos - the smokiness of grilled tofu s alluring even in the heat! These look SO GOOD Lisa!